Human resources representatives are responsible for completing a number of tasks within the HR department of the organization that they work for. Among their job duties are coordinating new hire orientation and answering staff members’ questions about HR policies and procedures. They devise workplace activities and programs that foster a welcoming environment encourage employees within different departments to develop relationships with one another. However, what happens when you are the new hire who has been hired as an HR rep? For the majority of new HR hires, the primary focus of the first few days and weeks will be spent becoming familiar with the systems, processes, and individuals with whom you will be interacting, as well as the organizational structure and physical environment of where you will be working. Don’t worry. Even if you have a bachelor’s degree (or advanced degree) in human resources, a new employer is not going to expect you to know everything right off of the bat. Each HR manager will orient their staff members in a different manner; however, almost all will include some or all of the following elements on your first day and week on the job. You will meet the staff members who work in your department and those who work in the groups that you will be interacting with the most often. If your new position is managerial, meetings will be conducted with all of your new staff members so that you can gain an overview of the current issues, projects, and priorities. Here is where you will equip your office or work space with all of the equipment, supplies, and items you will need. Organization charts will be provided to you so that you can familiarize yourself with the workplace structure in which you will be operating, and if you have been assigned a mentor or “work buddy”, you will be introduced to them. Initial projects and assignments will be clarified. Performance factors and expectations will be reviewed, and how your employer’s goals, value, vision, and mission are related to your development goals and performance will be explained. Most employers will have created an on-boarding plan for you, which discusses the immediate requirements for your position and any upcoming training that may be required. In your first few days and weeks in your new position, your direct manager will work closely with you to ensure that the most critical logistical matters have been properly attended to, like obtaining an employee ID and badge, ordering necessary equipment, and so forth. How to follow protocol for essential tasks, like notifying someone of a late arrival or absence or how to evacuate in the event of an emergency, will also be covered. In addition to learning the ins and outs of your new employer, you will more than likely be expected to undergo a significant amount of training during your first year working in human resources. There is almost always some training that must be completed during your first week. 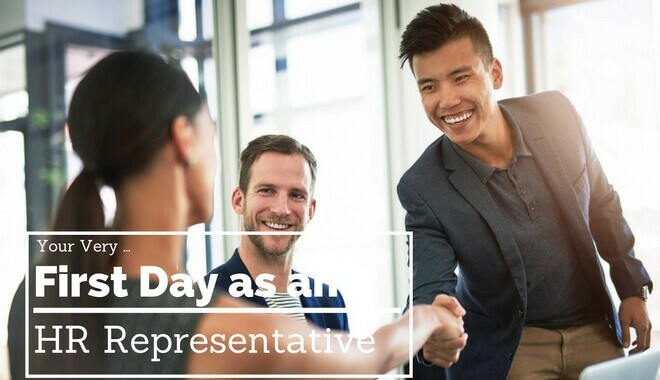 Required additional training for new HR reps varies from one organization to the next, and it will primarily be based upon your department and specific position. Your manager will discuss any additional training requirements with you and the time frames in which they must be completed. In your first few days and weeks on the job as an HR rep, there is going to be a lot of information thrown at you, and you won’t be able to absorb it all the first time around. Work hard, but don’t be afraid to ask for clarification or assistance when you need it.